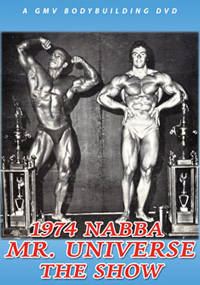 1973 NABBA Mr. Universe and the 1980 Mr. Olympia Show. Approximately 30 minutes each part. 1973 NABBA MR. UNIVERSE CONTEST - London, England September 23rd, 1973. Fantastic footage with CHRIS DICKERSON, SHIGERU SUGITA, IMLACH SHEARER, PETE CAPUTO, ROY PERROTT, ROY DUVAL, ROGELIO MONTENEGRO, TONY CAMILLERI, PAUL GRANT and others. A beautifully filmed, full colour record of this classic international event. 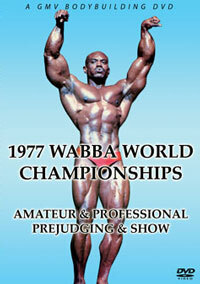 You will see BOYER COE, REG PARK, DENNIS TINERINO, ELIAS PETSAS, TONY EMMOTT, SJUR HALL etc. 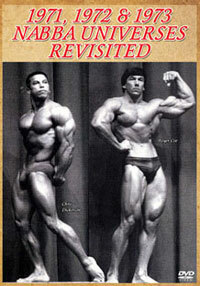 Sensational side-by-side posedown with BOYER COE and his nearest rivals. Professional Awards, Amateur Awards, and rare footage of the world's richest man, J. PAUL GETTY, as he presents the Mr. Universe trophies! This was the last time we filmed REG PARK in the NABBA Universe. See BOYER COE and CHRIS DICKERSON at their all time peak as they make it an overall Universe double victory for USA! What was even more remarkable this year, the following men from this contest went on to be future Mr. Universe winners: BILL RICHARDSON, ROGELIO MONTENEGRO, IMLACH SHEARER, IAN LAWRENCE and TONY EMMOTT. By coincidence, Emmott and Duval both went on to compete in the 1980 Mr. Olympia, as did Chris Dickerson, Boyer Coe and Dennis Tinerino! A fully illustrated in depth report of this contest was carried in Iron Man Magazine (Vol. 33 No.2). See full results below. We have solo features on a number of the men who feature in the Universe results below. 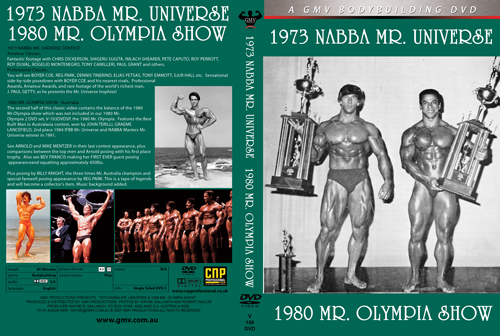 The second half of this classic DVD contains the balance of the 1980 Mr. Olympia show which was not included in our 1980 Mr. Olympia 2 DVD set, GAMM-103DVDSP, the 1980 Mr. Olympia. 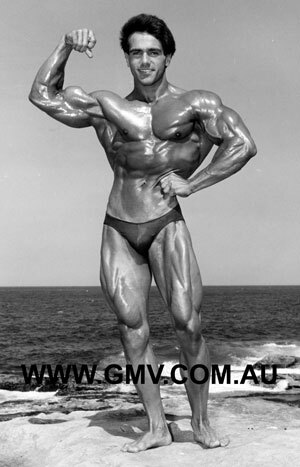 Shot at the famous Sydney Opera House, the show commences with the Best Built Man in Australasia contest, won by JOHN TERILLI (a future Olympian), and also features GRAEME LANCEFIELD, 2nd place 1984 IFBB Mr. Universe, and NABBA Masters Mr. Universe 1991. JOHN KOZIURA placed 3rd. 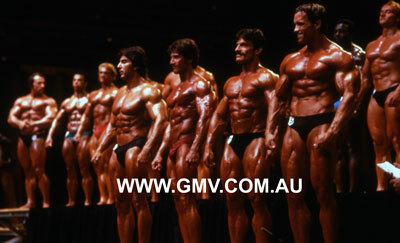 BILL PEARL then introduces all the Mr. Olympia competitors as they line up on stage. 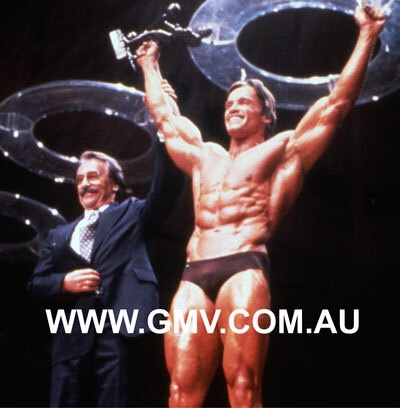 See ARNOLD and MIKE MENTZER in their last contest appearance, plus comparisons between the top men and Arnold posing with his first place trophy. You will see world champion power lifter and 1991 2nd place Ms. Olympia bodybuilder BEV FRANCIS making her FIRST EVER guest posing appearance. This is the first known footage of Bev (during which she also demonstrates her amazing strength by squatting approximately 450lbs) and it is all exclusive to GMV. Next you will see posing by BILLY KNIGHT, the three times Mr. Australia champion. Concludes with the special farewell posing appearance of the one and only REG PARK - Mr. Universe. This is a tape of legends and will become a collector's item. 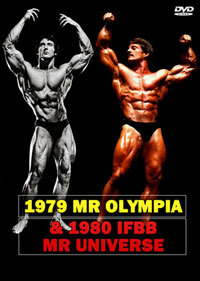 See below for the complete 1980 Mr. Olympia results. *** This classic DVD was shot on silent film and transferred to full colour video and then to DVD with background music added.